Send a Broadcast Message - A broadcast is a single message sent to a select group of prospects. Choose from an existing message or create a new one and send to your selected target list. 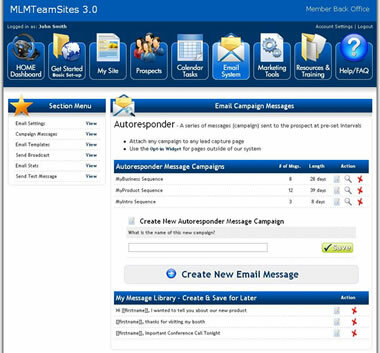 HTML Email Templates - Messages can be created from email templates as uploaded by admin if the user wishes to create their own message campaign. This can be controlled by our corporate feature "compliance module" if necessary. Test Email Messages - Each message can be tested without having to wait for the entire autoresponder series. This is a good way to see if everything looks ok before sending to actual prospects. 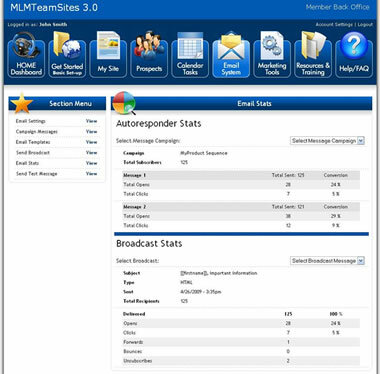 All autoresponder messages are tracked and reported giving you great insight to your open rates and click thrus and more. Each broadcast messages are tracked and reported giving you great insight to your open rates and click thrus and more. With each broadcast message sent, a history of key data is recorded and reported in this section, including Opens, Clicks, Forwards, Bounces and Unsubscribes.